A cold and drenched night calls for something toasty. If you happen to have buckwheat groats hanging about your pantry- you can whip up some soba cha or roasted buckwheat tea. I pan roasted my raw green groats for about five minutes minutes shaking the pan from time to time. 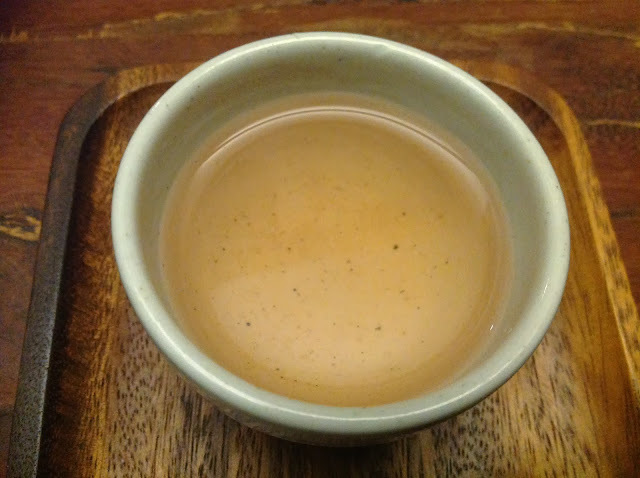 Soba cha is highly tolerant of overbrewing but you need to steep for at least three minutes- the tea is pale brown with a nutty and roasty taste that offends no one. One can even munch on the brewed groats with some honey. Roasted grain teas used to be the de facto beverage of Korean households as no one would drank tap water without boiling it. Instead of brewing, you let the toasted barley or corn boil in the water. I remember as a little girl, I was asked many a times to watch the grain teas but I often let them overboil. My mind was often occupied with grander things such as capturing a North Korean agent. Even in elementary school we were taught the endless superpowers of a North Korean agent- they could hide in the ground given only a stainless steel spoon. My clever plans to trap such a cunning spy revolved around tricking them with ice cream and choco-pie. 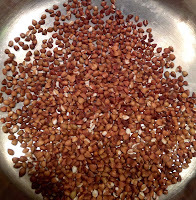 Roasting grains gave me such a cosy good feeling, I may have to contrive more occasions to dry fry.